Rangoli, also known as kolam, is a beautiful design of different patterns traditionally made using dried flours or fine salt. Rangoli is believed to bring prosperity, wealth and good luck and so rangoli decorations are put in front of homes and even streets. Some people love to put rangoli designs daily, but most of us put rangolis during festival times like Diwali. Here you can read more abut rangoli and find some beautiful rangoli designs and stencils to help you decorate your home during festivals. 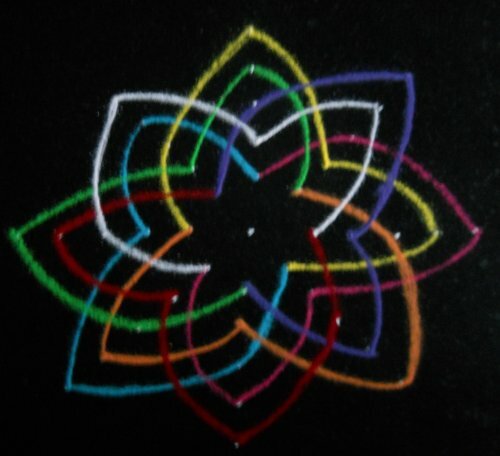 How To Make Rangoli Designs? Traditionally, rangoli designs are made using different kinds of flours, most commonly using dried rice flour. But you can also use coloured, fine salt or even sand, flowers etc. 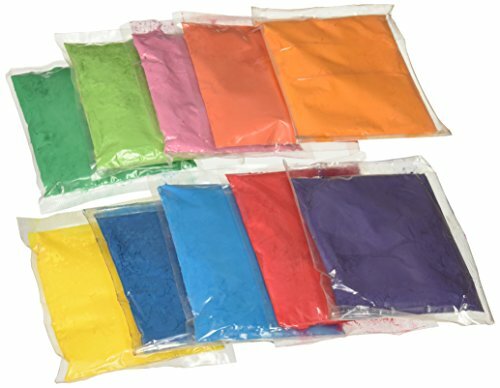 Some people prefer to decorate just with color powders which is also popular nowadays. Powdered stones or marbles are also used today, which is believed to work great for more complex designs. Once you have decided whether you are using dried flour or some other material to put rangoli, you also have to decide what kind of design you would like to draw. The most popular ones are usually floral patterns, religious symbols, images of deities or something nice that you design yourself.which is appropriate for the festival. It can be a very simple design to a very elaborated image which looks very artistic. Once you have decided the design and gathered the material to be used to make the rangoli, you need to draw the design on your floor. If you can draw nicely using your hands, that is the best and easiest thing to do. Just use the white colored flour to draw the outline of the design in your floor, then fill the shapes and patterns using different coloured flour or salt or whatever material you use. Traditionally, people used to put the rangoli designs in either square, hexagonal or circular grids. But today, this is becoming less common and mostly every one just draw the designs directly on the floor. 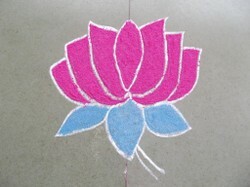 Below you can see a simple flower design of lotus, which you can easily draw yourself. If you are drawing with freehand, take some white coloured dried flour with your fingers and then make the design by slowly putting the flour little by little on to the flour. You can also make it more easy by drawing with a pencil first, then putting the white flour over the outlines made using the pencil. Then use dried coloured materials to fill the shapes you have drawn. I have also seen people using white chalk and colored powders to make rangoli designs. Even though this is not traditional, you can try it out if you would like to! 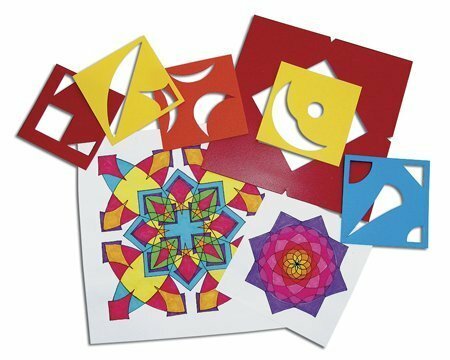 If you are not confident enough to draw the shapes or if you want to draw a design that is just difficult to draw with hands, you can also try to get a cut out of the design and then trace over the cuts to make the design. You can make the cut outs yourself using thin cardboards or thick papers. In India, there are also ready made small cylindrical boxes which have printed designs in them, you have to just fill the flour inside the boxes and then roll over the floor to get the beautiful outlines for the designs. 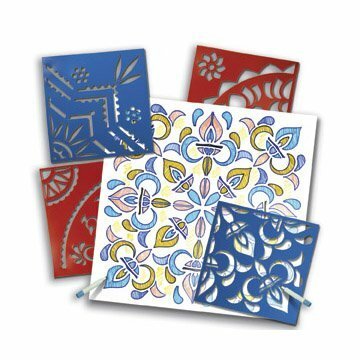 Or you can buy the readymade stencils which make the drawings more easy to do. If you don't want to use dried flours or fine salt that you have to add colours, you can also simply use colored powders to make the designs. You may also add the colored powders to the flour and salt, to make it more traditional. In older times, people used natural colors from turmeric powder or colors from flowers and leaves to make rangoli. To sprinkle the colors more easily over the designs, use some small containers that have lids with small holes in them. Fill the containers with colored powders and then sprinkle easily over the designs. Or use an appropriate mesh with very small holes. You may try using steel coffee filters or sieves or strainers. 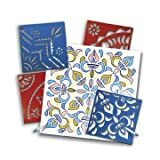 If you are a reader from India who wants to purchase the rangoli designs and other materials to draw the decorative designs, you can the find the related products from Amazon India here. Amazon India has a great collection of rangoli designs to make your festival decorations easier! Have you ever heard about rangoli decorations? Diwali is one of the most famous Indian festivals. Diwali is observed and celebrated mostly by Hindus to celebrate the victory of good over the evil. Read more about Diwali here. Thanks for the comment WriterArtist! That must have been a wonderful time for you, I agree Diwali time is so colourful and bright with lights, rangoli, sweets and more! This just reminded me of the grand celebrations of Diwali. Deepawali used to be a big festival - with long holidays, sweets and rangolis. My sisters and myself used to make huge rangolis in front of our house. It was such fun, the entire colony used to bathe in the colours of Diwali. I wish I had taken pictures of those beautiful rangolis we used to make on the floor, it used to appear as huge carpets of flowers and art.